Things have been really busy in our household the past couple of weeks. I can only imagine it will get more so as the baby’s due date draws near… just 10 weeks left! The weekend before last we went to visit my mom as well as my brother and his family. 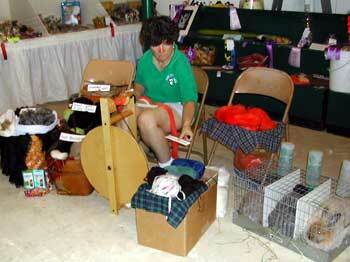 One of the things we did was to go to the 82nd Charles County Fair (Sept 15-18, 2005). There were sheep, of course, and some alpacas and other fibery things. Also, my brother’s wife gave me a brief tatting lesson, and I’ll share photos of my first tatting. Spinning in the 4-H building at the fair. Alpacas from Camillo Valley Alpacas. 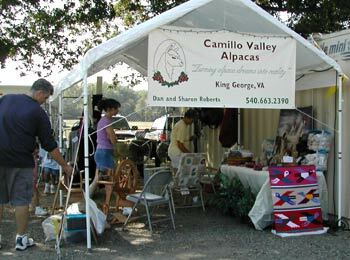 The Camillo Valley Alpacas booth at the fair. 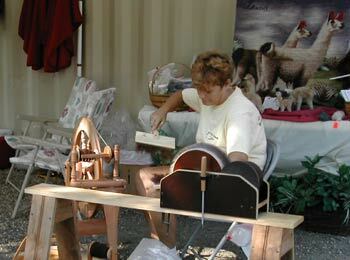 Carding wool at the Camillo Valley Alpacas booth. My first tatting and the tatting shuttle my brother’s wife gave me. Detail of my first tatting. My tension is uneven, but not bad considering most of it was done in the car on our drive home. On the right side are some attempts at picots. Those alpacas are sooo cute! Congrats on learning to tat…my sister took lessons. I’ve never even tried. That’s so much better than my first tries at tatting were! Way to go! Nice photos of the Fair. I’m really looking forward to my local fair next month. I want to learn to tat. It looks so neat and intricate. ONLY 10 WEEKS!! Wow that time has gone fast –and this will go fast but feel like forever!!! Oh, the lamas are so cute! Wish I had one. I’m impressed with your tatting. 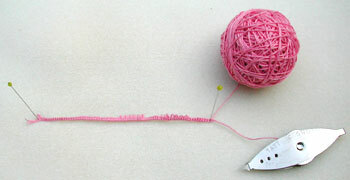 I’ve tried to learn a couple of times but it is the one needlework thing that I’ve never been able to figure out. Kudos to you!! Tatting looks so complicated! I get a headache even *thinking* about it. Congratulations on learning! Fairs are always so much fun.. aren’t they? Love the alpaca pictures :) Glad to hear things are well and good luck on these last few months before the baby arrives! WOW! I loved all those pics! 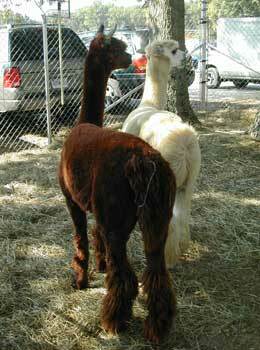 And the alpaca’s…..love it!!! Tatting….have never done it, would’t know where to start, but congrats to you on trying!!!! I’ve been shuttle tatting for ahem *cough* 25 years. My grandmother taught me when I was a teenager.